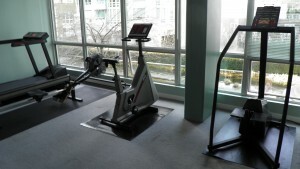 888’s gym contains state of the art workout equipment including free weights, elliptical machines, treadmills, weight machines and a steam room. There are also men’s and women’s washrooms complete with showers and lockers. Kindly use the available paper towels and disinfectant spray bottles to wipe down the gym equipment after use and observe the rules posted. Be careful not to drop weights or slam the plates of the weight machines as not to disturb residents on the floors below. The recreational facilities are for the use of owners, tenants and their guests. Each strata lot owner/resident is permitted a maximum of (2) guests at any one time in the exercise area. Children under 10 are not allowed in exercise area for their own safety. Children 10-16 must be supervised by an adult at all times. The adult must take full responsibility for the child’s activities while using the facilities. The equipment in the exercise area is extremely hazardous to all children and may cause serious injury.